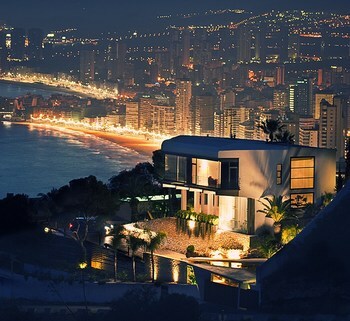 The "Diamond House", rebuilt by Abis Arquitectura, was built on one of the hills which dominates the city of Benidorm and is placed over a rocky soil. Its terraces and porches face south with a view to the Mediterranean Sea and to the skyscrapers in Benidorm. The House was found in an advanced state of degradation, having suffered multiple changes and unplanned additions along the times, threatening to erase its original character. The original Project, designed by the architect Luis Jiménez de Laiglesia in 1964 for Pr-Mr. Jean de la Croix, suffered from consecutive modifications which disguised the purity of its structure and design of its base. The house was built during the 60’s and as if it was an uncut diamond, it hides a very singular structural layout under its layers which we tried to recover and improve, getting rid of previous unnecessary architectural elements. The Diamond house was rebuilt in order to show its original geometry and its particular structure. In order to do so, all the unnecessary architectural elements were removed: handrails, stairs, lattices, chimneys, and so on. Enlarging the surface of the house meant the reuse of every space, used for storage or electric facilities, located below the sanitary forging. Those spaces were reused and were turned into the main floor at the swimming pool and the terrace level. The access to the house from the base of the site to the main entrance was not easy. By the restoring of the house a larger ramp was built in order to facilitate the access to the house.